It would have been perfect had the revered French actress Emmanuelle Riva received a Best Picture Oscar as an 86th birthday present yesterday but alas it was not to be. The top award went to a much younger actress, Jennifer Lawrence, for her role in Silver Linings Playbook. And she was great! But Riva, who did 'beat out' Lawrence (if you must look at it that way) for the BAFTA this year for her work in the sad and intimate Amour could probably care less. What she does have, besides this year's BAFTA, is a whole new audience curious about her work. That's the pro on the pro-con side of the entire awards season. Films and performances that might not be seen have a much better shot at getting their due. 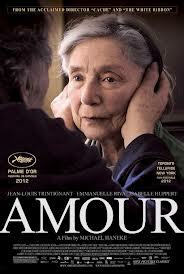 And as difficult a movie as Amour is at times to watch, Emmanuelle Riva's performance is worth watching. For cinephiles, Ms. Riva is most well known for the masterpiece of French New Wave, Hiroshima Mon Amor, from Alain Resnais, made in 1959. The Academy Award-nominated script from French novelist, Marguerite Duras tells the tale of a French actress (Riva) and a Japanese architect (Eiji Okada) engaging in an intense affair in postwar Hiroshima. It's been a long time since I've seen this film and I want to revisit it but my recollection is that, much like Amour, Hiroshima Mon Amour is dark, and no picnic in the park. If you've not seen either film perhaps a look at their respective trailers will pique your interest. 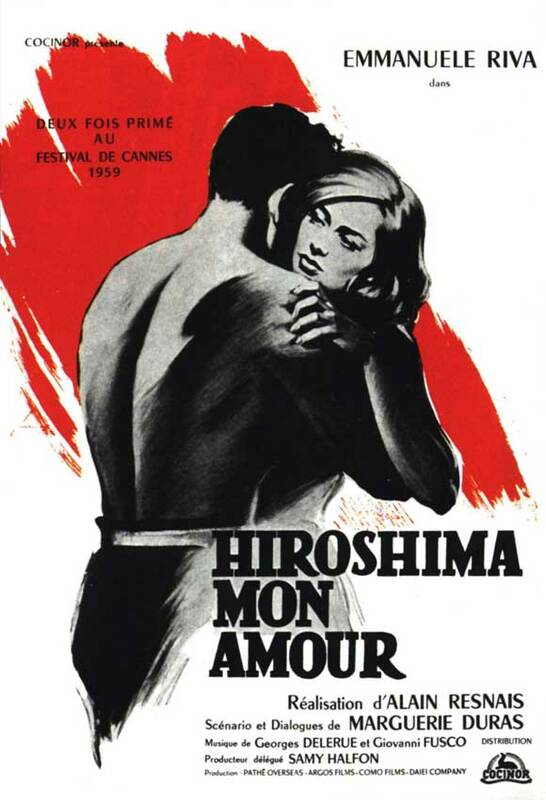 And take a look at this clip from Hiroshima Mon Amour. I wasn't able to find a clip with English subtitles but it gives you a good idea of mood and tone. And I can't help but note that Ms. Riva was slapped across the face by her amour in both films! That's pretty astounding when you think of it; we don't often see women getting slapped by men, thank God, in life or in film. I would say both incidents seem to be the "get hold of yourself" type slaps and I'm not sure how I feel about that somewhat archaic man-in-charge message. Dreaming of France is a meme hosted by Paulita at An Accidental Blog. Check it out on Mondays for all things French and fabulous. I can't believe you're playing Dreaming of France when your head is so full of Hollywood. Thanks. This film does look so sad. I enjoy the creative challenge of playing your French meme while trying to fulfill my own bookish movie news theme when I can. Like last week with the post about the Mr. Morgan's Last Love movie, based on a French book, shot in Paris. What could be more fitting, right?This week I wanted to write something Oscar related, and that fit your French theme. The post about Emmanuelle Riva hopefully filled the bill. Thanks for that clip. It leaves me a bit breathless (yes, talking about French New Wave). Emmanuelle Riva was such a classic beauty. She's still elegant and poise now at 86, but OMG, it's almost a mirror looking into our future! :( You're right though if she'd won, it would be quite something. But then again, she might have in Europe, but this is Hollywood, and Hollywood tends to slant more on its own. 'Breathless' is appropriate then, haha. While Riva didn't take home an Oscar of her own on Sunday she certainly owns part of the Best Foreign Language Film win. But you're right, Hollywood is pretty insular with its little inside favorites and let's face it, it's all business. Which makes the fact that the Los Angeles Film Critics Association gave their best actress prize to both Emmanuelle Riva AND Jennifer Lawrence a bit sweeter to me. As for Riva, she won the CESAR in Paris last week, she won the BAFTA, she's won the top prize from various film critics groups including the National Society of Film Critics, San Francisco, Boston, the European Film Awards and more. The sweetest victory would be another plum role in another fine film - judging from her imdb, she likes to work! Would I love that role to be in an English language film yes. But from what I gather she doesn't speak English and since I don't speak French I see more reading of subtitles in my future.